‘Tis the season for finding amazing gifts and gift sets that will pamper, indulge, and let the recipients know you appreciate the ability to treat them to something very special. There is no better way to do that than with products from one of the most appreciated and loved companies in the business: Crabtree & Evelyn of London. If you’ve ever used products from them, you already know how amazing they are, and how wonderful they would be for holiday gift giving. If you haven’t, you are in for a treat. Crabtree & Evelyn allows you the opportunity to marvel as the finest botanical ingredients are magically transformed into richly indulgent creams, keepsake boxes are meticulously embellished and sumptuous foods are prepared. Holiday Tins make perfect gifts and they can hang on the Christmas Tree! They offer festive ornament tins filled with nourishing hand creams (perfect for gifting to family, friends, teachers, etc.). These are practical gifts that combine with the love of the holiday via their amazingly cute little ornament tins that hang on the tree. I think these tins would look great as a stand-alone ornament on a desk too! Shimmering boxes filled with luxurious fragrance, like this Memory Makers Ultimate Nantucket Briar Gift Set that includes shower gel, body lotion, Eau de Toilette, and a bird ornament the perfect size for a Christmas Tree. This packaging on this set is really oh so cute and the box is one you’re going to want to keep long after the products are used and gone. Hand therapy crackers are absolutely perfect for tucking carefully away in a loved one’s stocking. Each cracker contains a tube of hand therapy, in limited edition scents such as Frosted Rose, Apple Snow, and Sugar & Spice. The crackers, a London favorite, are fun to give and to receive. The quality of Crabtree & Evelyn products is always luxurious, and always a delight to one’s senses. I know so many people who would love to find any one of these items under their tree this year, including me! You can learn more about these and the other products by visiting the Crabtree & Evelyn website. You can also follow them on Facebook and/or Twitter. We have one of their shops here in Omaha. I thought they were only in Omaha. I love their gift sets. I should so stop by there. 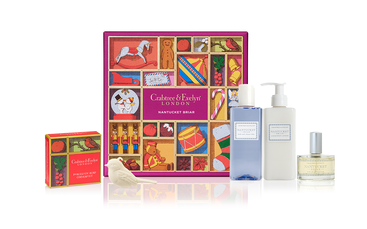 Ohhh, I love Crabtree & Evelyn products and these woudl be a perfect gift for me! I really like the limited edition scents and could totally go for the Sugar & Spice one! Totally love this. It could be a perfect gift to a lot of people - plus it saves me time to do the packaging too, lol! Crabtree & Evelyn is one of my favorite beauty brands! I need to try the Frosted Rose! Great ideas for stocking stuffers. I always look forward to beauty gifts. How cool. Never heard of this until today. Excellent. I so love Crabtree & Evelyn! They have the best lotions and the scents are just so lovely. These sets are definitely great and worth buying! I love the Crabtree & Evelyn of London products. They are perfect gift ideas. I have never heard about this company before. But love the cute festive products they have. This would be the perfect gift exchage for my holiday party. What a clever way to slip a special something into the Christmas stocking. Crabtree & Evelyn appear to have some awesome products. The Frosted Rose and Sugar & Spice are favorite scents. Sounds like they have great products. They would make great gifts for my girlfriends. Crabtree & Evelyn great Brand they have a lot of good product that I like. I love the packaging on the gift set! It's so pretty and festive, I don't know who wouldn't want to get that as a gift. I love Crabtree and Evelyn. The one close to my house shut down. I love Crabtree & Evelyn's gift sets. I always try to get them around the holidays! Crabtree and Evelyn makes the some of the best gifts for the Christmas season! That is totally stocking stuffer-worthy. I love Crabtree & Evelyn everything. They have the most delightful scents and luxurious products. What cute items, thanks for introducing this company to us. I'd love to have one of their festive ornament tins with nourishing goodies inside. they have such good smelling products. Absolutely love their products and it definitely was on my list for Christmas gifts. I love all of these, this is great gift set this coming Christmas. I love Crabtree & evelyn! I think so many of their scents are pretty. I haven't been to a Crabtree & Evelyn in years. I remember my aunt always loved to give me stuff from there for the holidays. What great gift ideas. I love the packaging. Crabtree & Evelyn products are so divine! I received some as a gift a few years back and have been hooked ever since! I love Crabtree and Evelyn! These look like great items from them. My mom bought me C&E perfume called Spider Lily and I love it! This makes such a nice gift! This would make a great gift to friends and family. I love the Crabtree and Evelyn products. I havee used this brand a couple times - might have to increase that! Hand therapy crackers are a great gift idea. I will have to get a few to put in the stockings this year. Love all of these, it would be nice for holiday gift idea. wow, what a treat! These are perfect stocking stuffers. I like Crabtree & Evelyn products, I always like Beauty Products as stocking stuffers! Happy Holidays! I love Crabtree & Evelyn! They have the best hand cream! Crabtree and Evelyn products are great! Slightly expensive, but worth it! They make great stocking stuffers too! Love Crabtree & Evelyn. Such great products. I love love love Crabtree & Evelyn. They come up with the best gift sets each year and they never to make good presents. Crabtree & Evelyn is one of my favorite brands. I love their products and their packaging is awesome too. my mother in law loves Crabtee & Evelyn! Reminds me I need to buy her something like this for christmas! These look like great stocking stuffers. Love the crackers! I have heard of Crabtree & Evelyn, but I have not shopped their before. I need to get into this store and check it out. I would love to get some of their wonderful items for the Holidays!